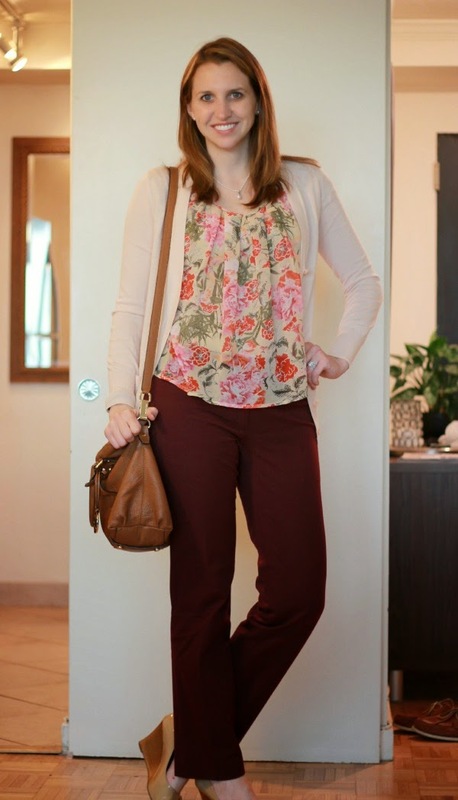 I decided I wanted to wear my maroon pants yesterday and then worked from there to put together this outfit. I last wore them in March in a neutral early spring outfit. 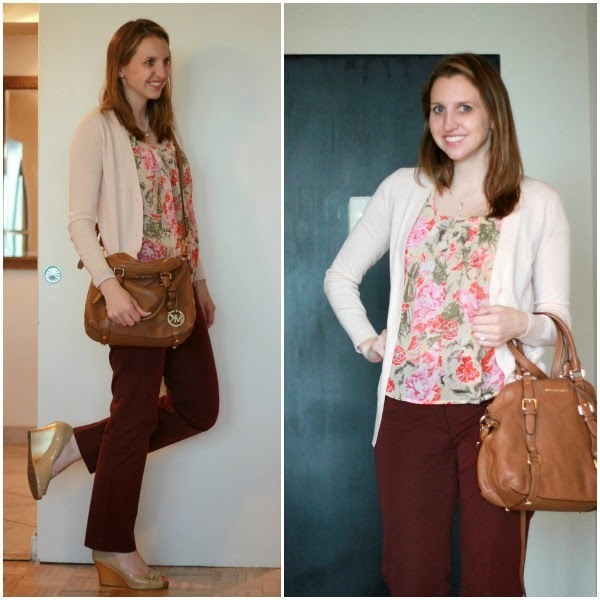 This time I decided to go even more spring-like with this flowy floral top and pale pink sweater. It was a warm day so I went with my open toe wedges. (Love these wedges by the way. I bought at the Lilly Pulitzer Warehouse Sale a year or two ago and I have worn them on a ton since I got them. Very comfortable and pair well with everything.) I grounded the outfit with my cognac MK satchel. The gold details on the purse tie into gold accents on the shoes. I had planned to take these pictures outside, but a shower was passing through after work, so I had to stay inside. 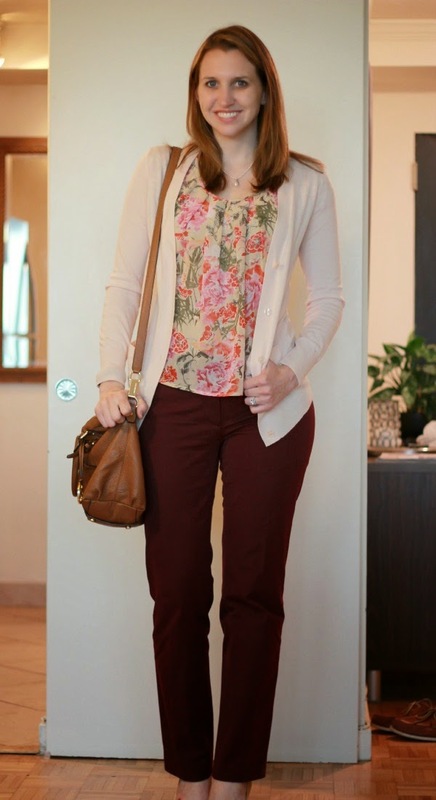 This outfit works with a pretty basic formula: interesting top, completer piece (cardigan), neutral pants, shoes with a little detail, and classic accessories. It's the formula used often on What Not to Wear. Jodie Noted has a really nice post about this formula with examples. Check it out here! Linking up with Perfectly Coutured, Vodka Infused Lemonade, Her & Nicole, The Charming Blog, The Alisha Nicole, and Get Your Pretty On.Life's a Party, Dress Like It, and Vain and Simple. 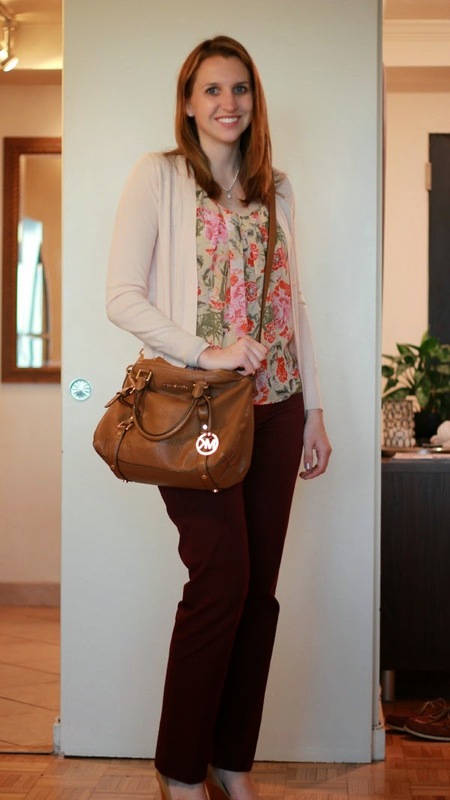 Loving your hair, floral top, wedges and gorgeous bag. MK has great bags. I only own that one but would always want more lol. 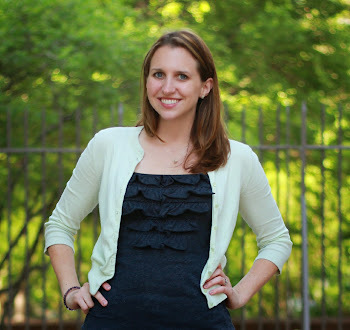 I wore my Maroon Cords one last time on Tuesday's Post. 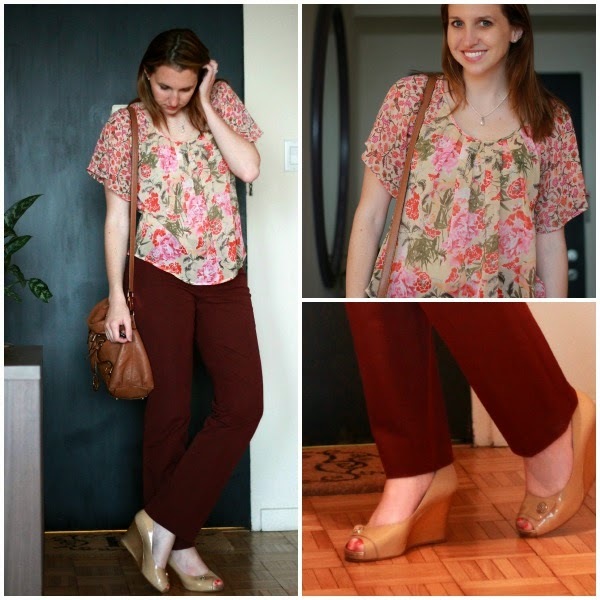 And I also wore some Floral lately (yesterday's post). Speaking of, I really like this Look and would love to feature it next Wednesday on my Blog for Spring's Must Haves - Floral, if you agree of course. For more, check out my blog, read yesterday's blog post and let me know if it's OK. Thanks. I'd love to be feature in your blog post, Ada! Thanks! OK, I am sorry I didn't read this until now. Sorry. That post was already posted yesterday (check it out) but I'd love to feature the dress you wore on Mother's Day for next Wed's post. We sort of love gardening! It's a lot of work and we are redoing ours now that we are in a new place (so it's hard getting motivated to get around to it), but it's always so worth it. My parents have a nice one and we look forward to the tomatoes and green beans that they grow! Good luck!! Thanks for linking up with Lovely Thursdays!